It’s told the story of two women who were asked to either leave their Christian sorority or end their relationship. Of a black transgender woman who died in police custody. Of women who spoke out about being sexually harassed by a renowned professor at the outset of their scientific careers. Today, our front page is blank. In its emptiness, it tells the story of a newspaper that needs your support — or it will risk losing the ability to tell any story at all. Vote yes on the Ink Initiative Student Fee in this week’s ASUC election to pass a $2.50 per semester fee that will help fund the Daily Cal for the next five years. The Ink Initiative will replace a $2 fee that already supports the Daily Cal but is set to expire in 2017. Having reported extensively on rising tuition at UC campuses, we do not take lightly the decision to ask for your help. One-third of the Ink Initiative money would go toward campus financial aid, and the other two-thirds would go toward maintaining the robust flow of information that the Daily Cal has provided free of cost to the Berkeley community since 1871. But the truth is, Daily Cal is still lifting itself out of the rubble of financial setbacks the journalism industry has suffered over the past decade. In 2008, we ended our Wednesday print edition amid a drastic series of cuts. In the last few years, we have slashed more than $120,000 from our budget but continue to run a deficit. We stand at a complicated juncture, because although ad sales have declined and printing is expensive, we cannot cut the print product entirely since paper ads still constitute the majority of our revenue. And even if we could cut print, we wouldn’t necessarily want to. The physical newspaper serves as a resource for homeless folks and other readers without access to a computer and also functions as a canvas for award-winning layout designers. But that is not to say our future is all gloom and doom. The 23 awards we recently won in the California College Media Association’s annual contest prove that despite budget cuts, we remain a training ground for journalistic excellence. Daily Cal reporters have gone on to work at The San Francisco Chronicle, The Los Angeles Times and POLITICO. Projects we’ve put out in the last year include a multimedia exploration of what it means to be a public university, an analysis of what department has the lowest grade average and an interactive crime map of campus. And on the business side, we are steadily building our revenue capacities by such actions as launching creative advertising packages and offering new avenues for reader engagement. Ink money would ferry us safely through the next chapter of innovating our funding model, making sure that these uncertainties of the journalism industry won’t capsize us. 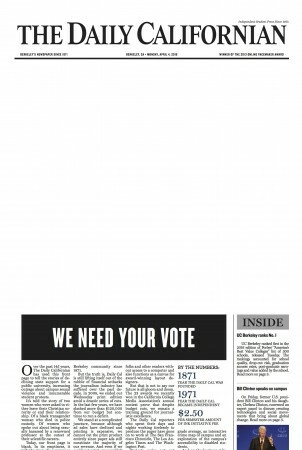 Vote today, Tuesday or Wednesday on the Ink Initiative at https://asuc.org/elections/ to have your say in the Daily Cal’s story. If it succeeds, we will retain the means to continue our long-held tradition of telling yours.